Jacob DeLaTorre leads the cheers in front of the Fort Scott student section during the Tigers' Homecoming games with their rival Pittsburg Purple Dragons. Perhaps the little guy's cheering helped as the Tigers won both the girls' and the boys' games. Blogger's Note: Please forgive rambling or jumping around in this blog. It's 1:46 a.m. At this hour, fingers go in different directions than the brain tells them to. Last year (and quite possibly the year before) there was a bit of animosity between the student section and the administration at Fort Scott High School. Without getting into anything specific (I'm not even really sure anymore), part of the student section was forbidden from participating in a handful of home and away basketball games. Furthermore, the typical costumes donned by students were also forbidden (I believe..). So far this season I've only attended and photographed a handful of games but I've noticed that the costumes are back and the student fans seem to be enjoying every minute of the action. At times the fans (mostly male) use their hands to fan the necks of the referees in order to keep them cool, chant at free throw attempts and even cheer repeatedly until their favorite player is allowed back into the game. 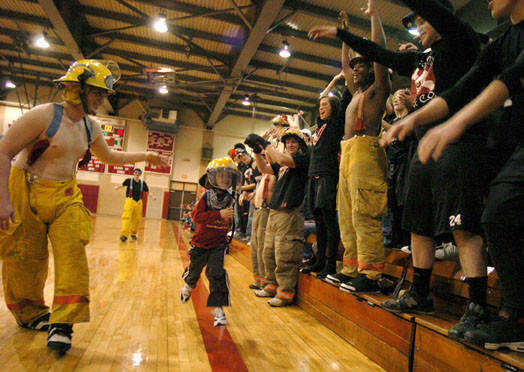 On Friday night the student section dressed as firefighters. Odd to the Pittsburg fans? Probably. Odd to the home crowd...probably not. Nothing was out of the ordinary. 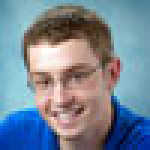 The typical students were involved except for one new face was standing on the bleachers between his buddies Andre Davis and Clint Lawrence. Boys coach Jeff DeLaTorre's son Jacob was standing shoulder to hip between the two seniors, showing off his white teeth and cool new fireman's helmet. It was a cute moment, something his mom asked me to photograph. That was the end of it I thought. Instead of hopping down and going back to mom to watch the game, he stayed and helped lead chants and clapped after good plays. Oh..he smiled a lot too. Perhaps the cutest moments were between quarters and at long breaks when one of the students would lead him up and down the sideline to cue the crowd into doing the Wave. It was nice to see the students (most of them not even legally considered adults) grab an enthusiastic kid and show everyone that their is a little hope in the generation that now walks up and down the halls of our high schools. It's nice to know that as recently as a year ago there wasn't a student section really at all and the administration had enough faith in its students to allow them to start fresh and provide a positive atmosphere at games. What's even better is that the students have responded in the way they have.